This book was a labor of love by Ed Walker, a man who loves good drinks and spooky stories with equal fervor. 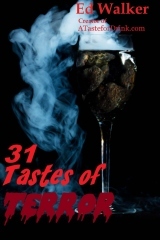 Having gathered together 31 great cocktails and tales of terror from author Edmund de Wight, 31 Tastes of Terror is a tome guaranteed to tickle your liver and send tingles up your spine. Within you will find 31 spooky cocktails to set the mood for your October festivities. Each tale of the supernatural and macabre is accompanied by a drink to help you survive the ghosts and ghouls that stalk the dark October nights. This entry was posted on November 3, 2016, 7:45 pm and is filed under Books, Drinks. You can follow any responses to this entry through RSS 2.0. Both comments and pings are currently closed.